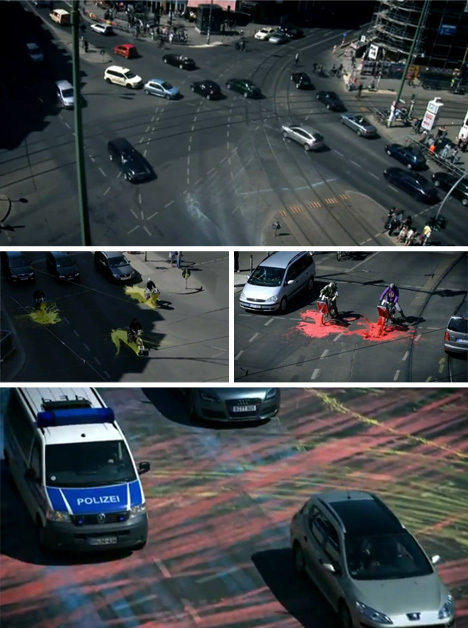 Ingredients: 500 liters of brightly-colored, eco-friendly, wash-away water-based paint, one elevated location with video camera and a whole mess of (2000) cars just waiting at an intersection to be unwitting participants in creating a huge mural. Guerilla artists of IEPE dumped blue, yellow, purple and red along each major motorway crossing at a single (huge) central space during a pause in traffic, all from their own well-timed vehicular conveyances stopped on the various sides. When they peeled away, bicyclists and moped riders began to trail thin lines of color, crossed in turn by larger leavings from four-wheeled vehicles around them. Mixed paints overlapped and bled to form new colors along the way. 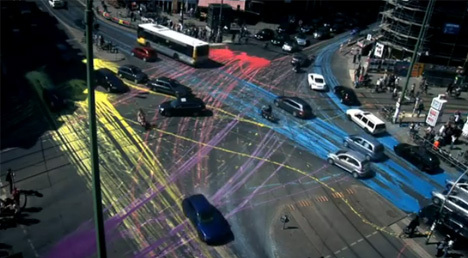 A beautifully simple act of interactive and chaotic art on the street – fortunately, no drivers were too distracted to stay the course despite the rather complex nature of this particular intersection.